Can genetic engineering stop Zika? 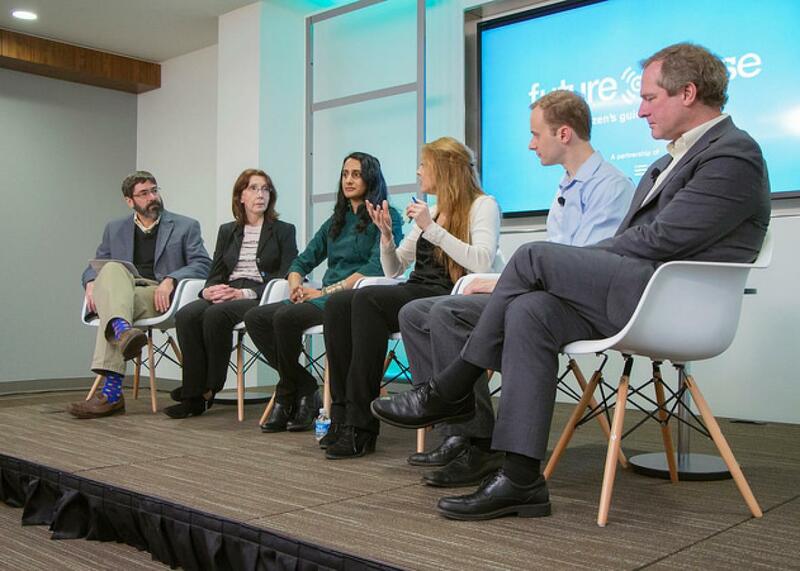 A Future Tense event recap. Richard Harris, Graciela Ostera, Bina Venkataraman, Eleonore Pauwels, Kevin Esvelt, and Andrew Maynard discuss Zika and genetic engineering at New America. It’s easy to forget that the Zika virus—which has been linked to microcephaly in fetuses, paralysis, and miscarriage, among other things—burst onto the international scene mere weeks ago. In that time, as the news of the virus has spread around the globe—and, so, too, has fear that the virus’s territory may expand from Latin America to the United States and elsewhere, carried primarily by the Aedes aegypti mosquito. In tandem with reports about the virus’ potential effects and research into the vaccine, there have been calls to use technology to modify or even eradicate mosquitoes to save human lives. On Feb. 23, Future Tense—a partnership of Slate, New America, and Arizona State University—held an event in Washington, D.C., to discuss the potential use of genetic engineering to stop Aedes aegypti from spreading Zika as well as dengue, yellow fever, and chikungunya. (“It’s a nasty beast,” as moderator Richard Harris, science correspondent on leave from NPR and a visiting scholar at ASU’s Consortium for Science, Policy, & Outcomes, put it.) Combined, these diseases kill tens of thousands each year, and they may also begin to appear in new areas, as climate change allows Aedes aegypti to make its home in new places. But as panelists at the event made clear, it’s genetic engineering won’t be as easy as swatting at a bug nibbling on your arm—and an awful lot of discussion has to take place before large-scale mosquito-meddling takes place. One of the things that the speakers emphasized was just how rudimentary our understanding of Zika is—at least in humans. Graciela Ostera, the director of the Immigrant Health Initiative at Georgetown University Medical Center’s Microbiology & Immunology Department, noted that it was first uncovered in Africa in the 1940s but was “associated with animal infection.” Furthermore, questions remain about the link between Zika and microcephaly, a condition in which babies are born with small heads, leading to other complications. It’s oft-cited that in one region of Brazil, about 4,000 babies with microcephaly were born to women believed to have contracted Zika during their pregnancies, but it isn’t clear that all of those cases were actually caused by Zika. Still, other serious medical problems related to Zika may crop up. The company breeds and releases into the wild male mosquitoes that don’t produce viable offspring. When females mate with the GMO males, they lay eggs that hatch but the larvae die before adulthood. Oxitec says trials conducted in Brazil and other countries over the past decade show releasing bioengineered male mosquitoes can reduce the wild Aedes aegypti population by 90 percent. happens whenever a particular genetic element spreads through a population even though it doesn’t help the organism to reproduce. … [I]t’s a naturally occurring phenomenon, essentially every organism on the planet has either an active gene drive element or the broken remnants of one in its genome already. The question is, should we harness that phenomenon to spread changes that we are interested in? That question of should such technology be used, rather than what the technology itself would look like, made up the bulk of the conversation. (For more detail on how gene drive works, read this great explainer from the medicine news site STAT.) Perhaps most importantly, the panelists wanted to know who would be able to answer the question. Eleonore Pauwels, a senior associate and scholar in the Woodrow Wilson International Center for Scholars’ Science and Technology Innovation Program, suggesteds that this might be a “test case for how do we better involve citizens … from different social background, from different cultures, different countries, into the innovation journey.” The “foresight required” will take require “more than the work of experts, elites, and more than political. It will require people to be able to gain enough knowledge, and digest that knowledge and own that knowledge so that they can be part of what we need to do.” She pointed to citizen science projects in Spain and Germany to monitor mosquitoes as evidence that nonexperts can and should be involved. Bina Venkataraman, a Carnegie fellow at New America and director of Global Policy Initiatives at the Broad Institute, echoed these points about engagement by emphasizing that there is “a serious risk here of eroding the public trust—in fact, damaging the public trust so severely with respect to the technologies of CRISPR, to the technologies of gene drive” that it may ultimately affect our ability to use them to, for instance, treat cancer. The conspiracy theories about Zika already floating around might be related to poor understanding and a lack of engagement with the public. As the Zika discussion continues, then, it will be critical to make sure that a diversity of voices are taking part—and being heard and understood. You can watch the full event on the New America site.